Our Goat Shed- warning lots of pictures! When we first moved here 4 years ago, we had to move the goats into a single and a half garage, and a wooden shed of roughly the same size. There were 6 very large outdoor dog runs, made out of corrugated iron and stock fencing, but they were too run down to put any goats in. We were also hampered by the fact that we had no money for 9 months after we moved in, because we didn't get funds from our old property until that time! Just to prove, you can keep goats in a garage! 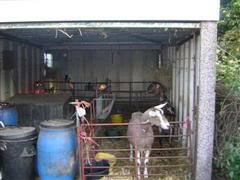 We had 5 pens in that garage, plus our old metal feed bin! One thing we are very aware of, is the fact that we might have to re-sell again in a few years time, due to personal reasons. For that reason, we try and make the stuff we have added suitable for anything. So in October 3 years ago, we built our goat shed, having demolished the dog runs, and having moved the wooden shed into the field, it was in the way of where the new shed was going, but we still needed it until the new shed was built. We chose a builder in our nearest village, though chance as it happened, I found their stand at the Royal Highland Show. 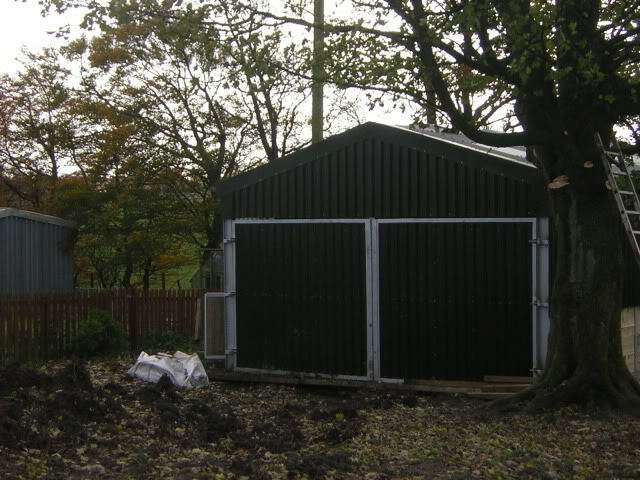 We wanted a shed 20 foot across by 60 foot long, with big doors at the top to allow us to unload feeding, hay and straw easily, and also a smaller stable type door at the side, for easier access. 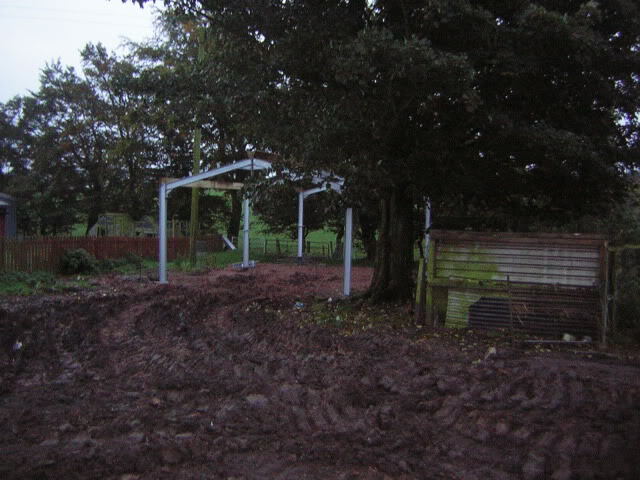 We went for one big shed, on the basis it was a more flexible space. 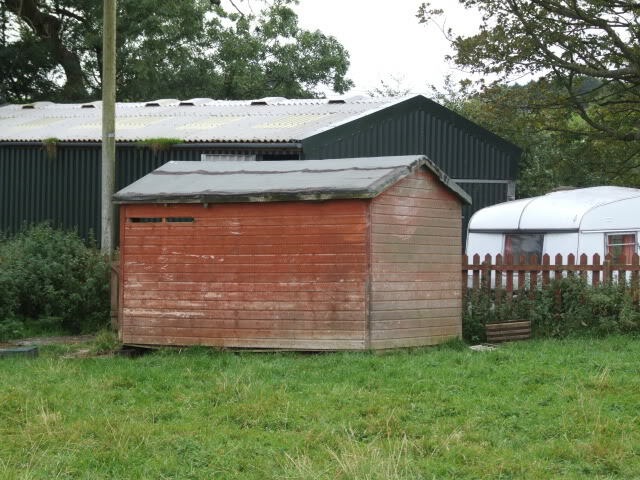 Also if we wanted to resell, it could be a shed for livestock, for horses with a couple of looseboxes fitted internally, for a workshop, or as a garage. The start of building. Look at that mud! The shed is made out of wood batons, about 4" by 2" on 3 sides of the shed. This only goes up to about 4.5ft, and the wood fits into steel slots. This is so, if a panel of wood gets rotten, or gets too chewed by the goats, it can then just be taken out and replaced. The top half of the building, and the front big doors are just covered in Green corrugating sheeting. And as the shed was just finished. We opted to use hurdles, again, so our penning for the goats could be as flexible as possible. It means we can make a bigger pen for lots of kids to all live together, or if we want we can pen all milkers separately. We ordered hurdles from Modulamb in Coventry, as they also did gated hurdles. My mother has arthritis in her ankles and climbing into pens over hurdles isn't easy, so we ordered a number of ordinary hurdles, but 4 ft high. Plus we ordered 8 gated hurdles, and 4 sheeted hurdles. When the hurdles arrived, they were unloaded at the bottom of the driveway (might even have been before the driveway was concreted in actually! ), so we had to move them. Well, the man from Modulamb had unloaded them all on his own. It took 3 people to carry the gated hurdles up to the goatshed they are so heavy. Even now if I am rearranging pens in the shed I can only drag the sheeted and gated hurdles. I have to say, even though they are so heavy, they are fantastic. It was so worthwhile getting them. They were quite expensive, but I am glad we spent the extra money. The sheeted hurdles have too proved worth their weight in gold. We use them at the end of a block of pens to cut out drafts for the goats, but also it stops them poking their heads through! So we have them beside when we keep their food, and the milking bench. We also use the sheeted hurdles to prevent the billy becoming too amorous as it means he a solid partition in between him and the goats. Here are some pictures I took last week in the shed. The billy goat- you can see he has a sheeted hurdle at the side there. 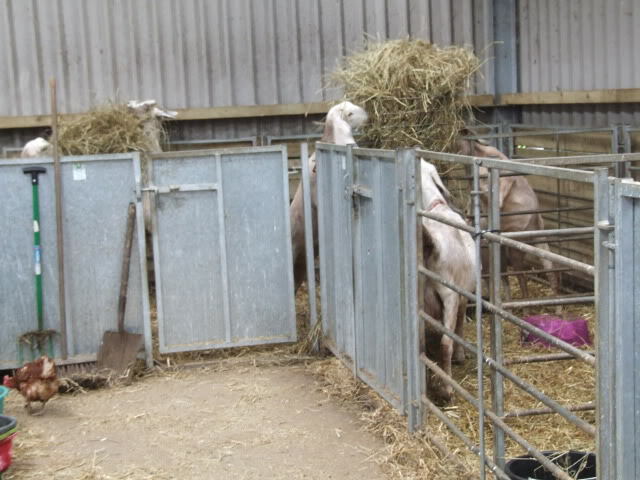 Room in the shed to store big bales of hay and straw- less room just now as we have extra goats! A shot from our field, it shows our old wooden shed which is now a field shelter, with the goatshed in the background. We don't have that much land here, not much over an acre really. However the field isn't grazed bare by the goats. We are in a damp area, and we don't put the goats out all the time. They are inside every day from about 6:30pm, and we don't put them out all, even in summer, if it is raining hard. The billy does however, go out in the evening and in good weather (when do we get that?!) he stays out in the field all night. 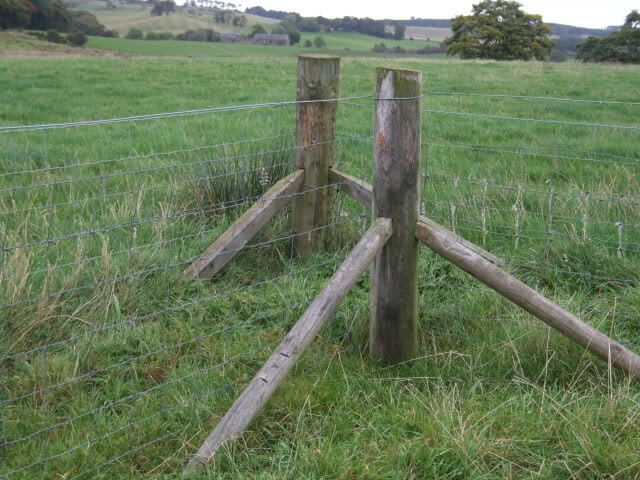 Our fencing is standard 3.5 foot high stock fencing, with a single strand of wire along the top. We haven't ever had anyone escape from the field, which just goes to prove goats are not really escape artists! We do however have double fencing round the field, which means that our goats and the sheep in the next door field cannot touch noses. Makes us a little more protected from diseases, and also movement restrictions. To be fair, our goats are pampered, they are more our pets and showing them is our hobby. Although that said, they do have to work hard, we don't like to keep a goat that isn't earning its keep. Therefore we expect our females to milk, and to milk well. I would expect at least 4 kilos/ litres a day from any of our goats at their peak yield, and generally would expect 6 or 7 kilos/litres from a second kidder. We have an area in the shed where we keep their food, in barrels generally. This area also holds a milking bench, and the goats come out of their pen, up on the bench and stand to get milked. The bench is wooden and was made by my brother in law. We don't feed them whilst they are getting milked, we prefer them to stand naturally, and they will happily chew away at the cud. I can't think of anything else to say now! Re: Our Goat Shed- warning lots of pictures! Thanks for posting the pictures, I always love looking at other peoples goat keeping setup. I keep mine in a garage but it looks bigger than the one you started with, I manage to keep 5 goats in mine in 2m x 2m pens, store 40 bales of hay at the far end, and have a wall to keep three feed bins and a kitchen cabinet in which I keep my various supplies. 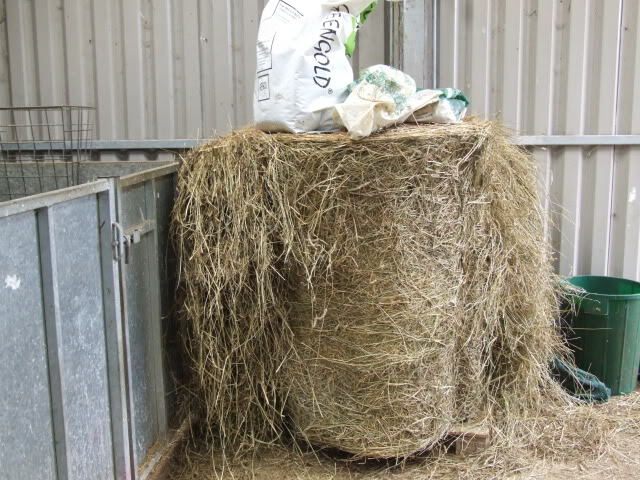 I also built a lean to on down one side of the building in which I store 2 large rounds of straw and more hay. It works fine although despite putting a brand new roof on it there is the occassional leak down one side, the join between the garage and the lean to roof has no flashing. Its a job I must do this summer! Anyone keep all their goats in one large pen like in commerical goat keeping systems or does everyone keep them in small groups of singly in individual pens? I considered turning have my garage into one enourmous pen but I am not sure my milker Clover would like it, she is a grumpy goat sometimes. Ill post some pictures up soon. 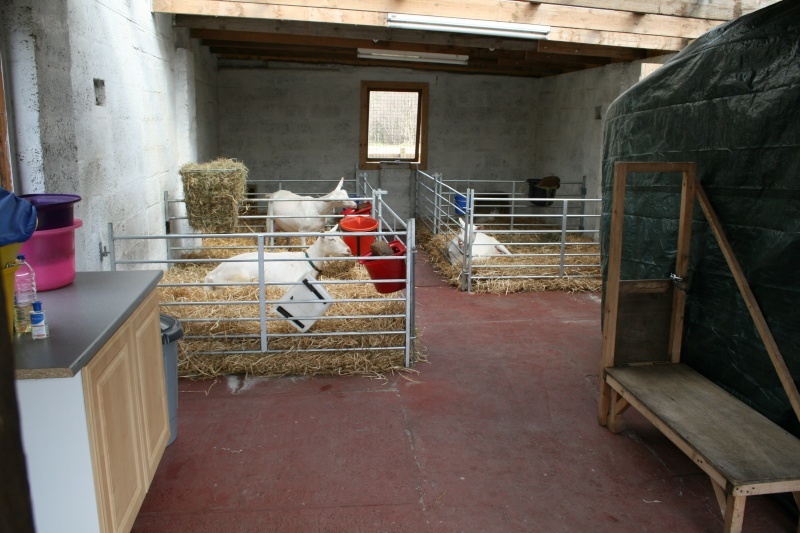 This is a photograph of my goat house in April 2008, it really hasn't changed much at all, except that I brought a hay rack for the pens without one in the photograph and I mounted salt licks on the walls of the pens. Under the tarpaulin are 40 bales of hay with my milking stand in front of that. 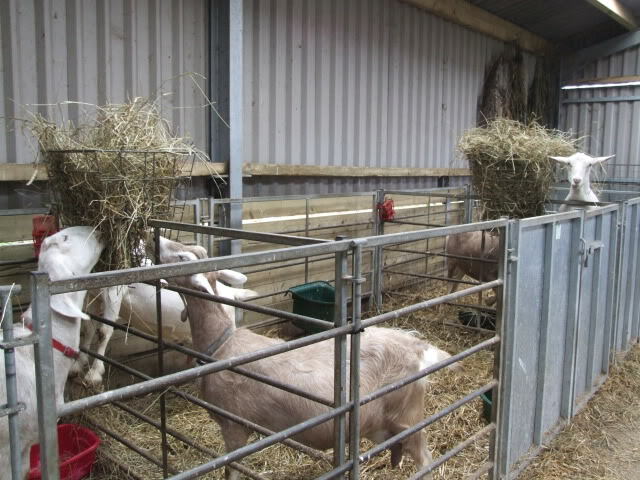 On the left is my supplies cupboard and just out of shot are my feed bins, all with very secure lids incase of escape although I have never had a goat escape but better be safe than sorry I suppose. Hidden by the tarpaulin covered hay is a stable door to the lean to in which I keep hay and beyond that is the small paddock. I built a field shelter at the far end of the paddock to provide shelter form showers but now I have obtained more ground I plan to rip it down and get a moveable shelter, as the ground gets pretty poached around permenant shelter and the moles don't help either. Ill take some pictures my paddocks and post them up soon. Nice shed Daryl, and its obviously well looked after and maintained. I think Lisa and Janet may have also given you lessons in keeping your goat shed clean! I notice you have hooks/brackets to connect the hurdles to the wall, we use those as well in places, and they are so useful. Ours just screw into the wood, and we can unscrew them and move them round as we move the pens around. Your garage is much bigger than ours is, and looks pretty near perfect for keeping goats in. I have known people who keep their goats all run together, though most have given up goats now. Sheila Little who lives near Castle Douglas runs all of her goats as one herd, but I think she has a few "kidding pens". She started keeping her goats like that out of necessity, as she had a commercial milking herd, but she has had to give that up more recently. We do pen goats together, our youngstock always run together, and we try and double up the milkers. But normally it has to be carefully considered who goes in with who, they get on best with other goats which were born the same year. Just now the two pregnant goatlings are sharing, as are the two BT's and the two AN's. Christina, our BA and Kream normally share a pen, but Christina only has 2 weeks to go before kidding, so she needs to be on her own. Mum met the man who owned the firm that built our shed today, and we were speaking about adding on a lean to on the side as well. Maybe to make a billy pen and room for storing hay/straw. Although he has stopping running the company to build sheds, he did say to get in touch if want anything done to the shed, which is handy. 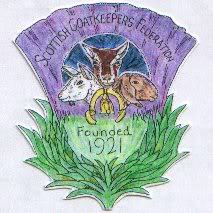 I do try and keep in tidy and possible, When I went to see Lillian Scobied goat when making enquries about goats and also when I went to collect Lily and Fern both were very good examples of a clean and healthy goat house so I was keen to follow their lead. I thought it would be hard work but other than big muck outs its pretty much part of my daily routine now and with the radio on a quick sweep round in enjoyable. Yes the hooks are brilliant, I used to have hurdles without the eyes and rods and I had some clamps made by frenchall goats to attach them to the wall but when the kids were due I decided to change all my hurdles at the same time as building kid pens. Frenchall goats are really great, they also made me a hay rack cover to stop my goas wasting hay, although I need a few more as my goatlings (bit too old to be goatlings but not mated yet) are terrible for pulling it all out! I imagined keeping goat communially would be easier in terms of mucking out but with more thought I imagine the straw would get churned up a lot with them all playing and fighting so would probably need cleaning out ever more often. I would really like to system where the goats can go in and out as they please but without a lot more land I can't do that. Hey Beth & Daryl, didn't realise how much you could say about a shed!! Sorry, being sarcastic. 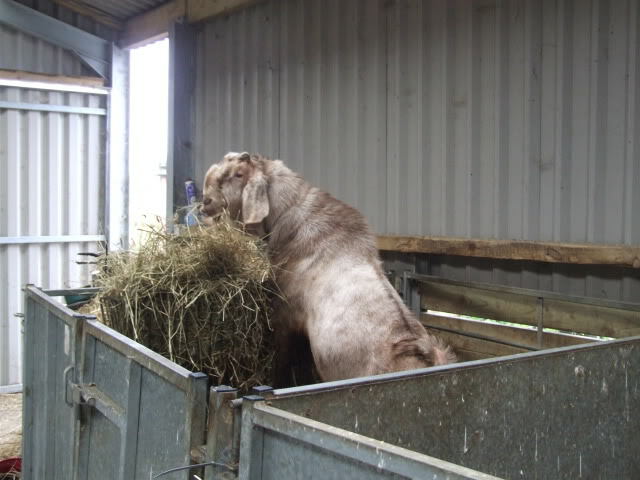 Think you both complimented Mum and me on our goat shed cleanliness, thanks. Whats that chicken doing in your shed Beth, 3rd big picture I think, left hand corner, ha ha. Am a bit new to all this so haven't figured how to add a picture yet, one of those little buttons at the top no doubt, will get round to it somehow. Its easy to talk about goats and their accomodation....everyone does it slightly differently and I like hearing about the differences....and there are usually good ideas I can steal to use in my goat house...like the Sheeted hurdles in Beths goat house....they would be excellent as occassionally (fortunatley not often now) my goat Fern puts her big head through the rails.....it comes out easy enough but she panics at the time.....I thought goats were intelligent? I can talk about anything related to goats really! I love the sheeted hurdles Daryl, we also managed to buy just the right amount, 4 seems to be perfect. They're great for using to keep the goats away from food, and the milking bench. Ever the observant person, I notice that there is grass growing out of the gutters on your shed beth, hope you have cleaned them out now, remember basic maintenance can save costs later!! I prefer good old traditional wood for pens, not so hard wearing, not so easy to clean and the goats eat them! But each to his own. We set our rails far enough apart so that the goats can get their heads through easily. I wish we'd put drains in underneath the bedding areas!! 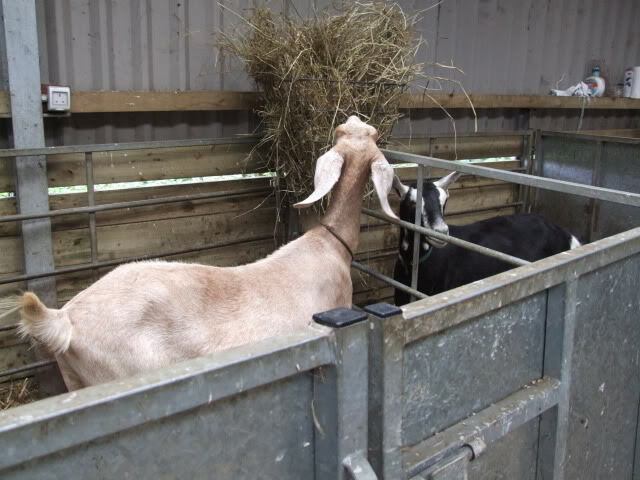 True about the goats liking to eat wood, my two goatlings enjoy very much chewing the stable door I built and fitted into the wall of my goat house leading to the hay store! Thank fully its built from new floorboards so totally untreated and safe for them to munch! Agree about the grass in the guttering....I have plenty of maintainance to do.....always the same in spring; a gate to hang, fencing to tighten, a field shelter to muck out (urgently!!! ), a goat house to muck out. A window and door to fix, entire goat house to wash out, roof lights to clean, salt lick holders to replace(metal holder and salty wet licks do not mix!!!) and electic fencing to install. All that and I still have to sew some veg seeds in pots, and try and dig a patch to sew the forage seeds I brought last year! Completely agree about the endless work! And on top of the maintanence, then there is the round of kid feeds, goat feeds and water bucket fillings. And on top of that, my family actually expect me to see them sometimes! The cheek they have.